Seven topical DHT blocker products for hair growth are compared below. So, if you want to use a natural DHT blocker for your hair loss, this review will help. All these products contain saw palmetto and other natural substances. But, despite the natural ingredients, some of these creams, serums and lotions have problems as you'll see. The table below will help you compare products and decide which, if any, might be the best one to use. DHT (dihydrotestosterone) is, of course, the hormone with the biggest connection to hair loss (androgenetic alopecia). Clearly then, it's the hormone that most men (and many women) try to counteract by using products that contain natural DHT blocker substances (especially saw palmetto) as alternatives to the drug Propecia (which also blocks DHT production but can cause nasty side effects as well). Nisim conducted trials on 148 men and assessed performance using photos and a hair count. Procerin conducted trials on 32 men and assessed performance using physical examination, photos and a questionnaire. Revivogen conducted trials on 34 men and five women, and assessed performance using before and after questionnaires. HairGenesis had some of its ingredients tested in a lab. From the chart, you can see that only Procerin states that its topical DHT blocker product is intended to be used by men only. All the rest suggest that there’s no problem for women to use them as well. However, if you read my saw palmetto side effects article, you'll see that there are several potential problems, including a risk to pregnant women. But, whether or not such problems in women could be caused by applying DHT inhibitors only to the scalp is uncertain. 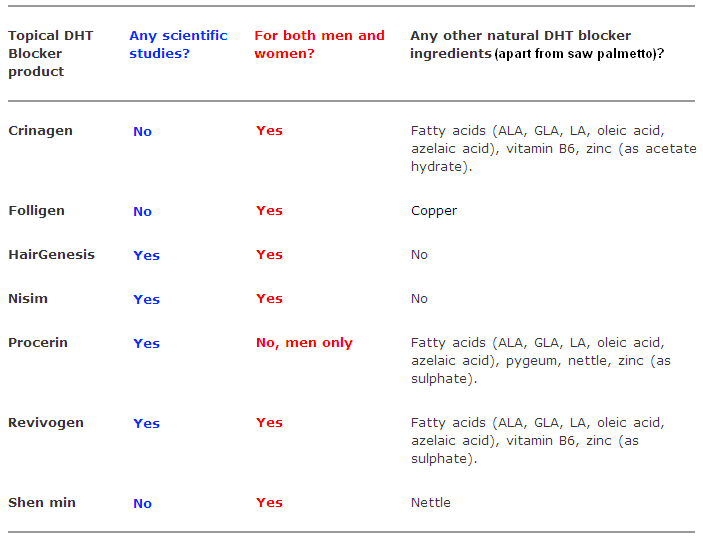 All products reviewed on this page contain saw palmetto as a standardized extract (which is the most effective form). But, there are several other DHT blocker substances within these products as well. From the final column in the table, you can see that Crinagen and Revivogen seem to have virtually identical active ingredients (although, interestingly, both official websites state that their particular formulation is unique). When I looked more closely at these two products ingredient lists, it appears that they differ slightly due to another ingredient, beta-sitosterol. Beta-sitosterol is a biologically active substance that occurs naturally within saw palmetto in small amounts. However, Crinagen doesn’t list beta-sitosterol as an ingredient at all (i.e., even though it does contain saw palmetto), and Revivogen lists beta-sitosterol separately from saw palmetto. So, make of all that what you will! Procerin also contains very similar active ingredients to Revivogen and Crinagen. But to what extent depends on which website you're visiting - the UK website does not list seven ingredients that are listed on the US website (including GLA and zinc). Shen Min has a massive 39 ingredients, but it looks like saw palmetto and nettle are the only two DHT blocker substances it contains. And in HairGenesis and Nisim, saw palmetto seems to be the only one. From the sheer complexity of all this, it's seems impossible to know which product is the most effective at reducing dihydrotestosterone levels without trying them all! Do you need to use more than just saw palmetto? Well, obviously most manufacturers think so! 1. Saw palmetto is hardly unique. There are loads of hair regrowth products that contain this herb. So, to try and stand out from the crowd, manufacturers often add many more active ingredients, including hair growth stimulators and extra DHT inhibitors. Even so, some products still seem virtually identical (as is the case with Crinagen and Revivogen). 2. DHT inhibitors work by either blocking 5-alpha reductase from forming DHT, blocking DHT from attaching to androgen receptors, or both. Saw palmetto might do both. But, that’s not known for sure. So, adding other substances that can affect DHT production, might guarantee that the DHT levels in your hair follicles will decrease as intended. Gamma linolenic acid (GLA) is said to be the most potent natural DHT blocker. So, including this particular ingredient does seem to make sense. But, as for adding a whole multitude of DHT blockers, frankly I don’t see the point. Crinagen - Although they have just a single product, one page of the website describes it as a topical lotion, and another as a topical spray. How to use: not stated. Folligen Cream and Folligen Lotion products - Identical ingredients but in different proportions (the cream is thicker). How to use: leave on scalp for six or more hours. You can also use their Emu Oil for Hair product to help with absorption. Learn more about Folligen products? HairGenesis Trichoceutical Activator Serum Generation VI Maximum Strength Formula(!) - How to use: massage serum into wet hair, leave for just one or two minutes, then rinse out. Nisim Biofactors Extract - There's an original formula (for oily hair) and gel formula (for dry hair). How to use: apply twice a day - you must also use Nisim NewHair Biofactors Shampoo. Procerin XT Topical Activator Foam - How to use: you apply the foam one or more times per day depending upon the sensitivity of your skin. The website also states that, for better results, you should use their other product, Procerin Tablets, too. Revivogen Scalp Therapy - How to use: it's a topical solution you put on every night and then use their other products, Bio-Cleansing Shampoo and Thickening Conditioner every morning. Shen Min Topical - How to use: Apply up to 20 drops to the scalp every night. You can see from this review (and also the previous page), just how complicated and confusing hair loss product research can be. And the uncertainty surrounding both oral and topical DHT blocker products strongly suggests to me that, by taking them, you might not be doing much, if anything, to help save your hair. Furthermore, DHT blocker substances don’t address the underlying mechanism that causes this type of hair loss in the first place - skull expansion. This page 2 of 2. Read previous page? Oral saw palmetto supplements.